Victoire Ingabire Umuhoza, leader of the Rwandan political party of the opposition FDU-Inkingi, who was sentenced to eight years of imprisonment by Kigali High Court on Tuesday October 30, 2012. 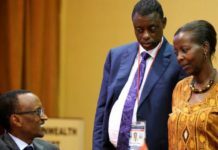 Monday 25th March 2013, the leader of the Rwandan political party from the opposition – FDU-Inkingi, Victoire Ingabire, went to the High Court in Kigali for her appeal trial against her condemnation to 8 years of imprisonment pronounced last October. 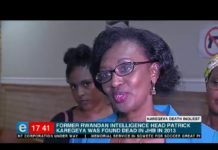 Amnesty International which has followed her case from the beginning has documented the background of the case and highlighted significant dates in the perilous journey of the Rwandan politician from her return to her country on January 16th 2010 up to now. The human rights organization made the following recommendations for a fair appeal trial of Victoire Ingabire. 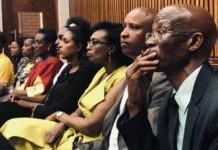 The Rwandan police forcibly stopped members of FDU-Inkingi trying to participate to the hearing of their leader at the High Court in Kigali on Monday 25 03 13. Ensure that Victoire Ingabire is provided with an appeal trial which complies with international fair trial standards. Guard all individuals’ right to the presumption of innocence and refrain from making public statements regarding individuals’ culpability prior to sentencing. Encourage judges to uphold the principle of equality of arms by ensuring that each party has the same procedural means and opportunities available to them during the trial and are in an equal position to make their case under conditions that do not place them at a substantial disadvantage vis-à-vis the opposing party. Ensure that any statement obtained by torture or other ill-treatment is inadmissible in any proceedings, except in proceedings against a person accused of torture or other ill-treatment as evidence that the statement was made. Encourage judges to test evidence, including by asking probing questions about individuals who may have been detained in secret or military facilities to ascertain when and by whom they were arrested, where they were detained, by whom, about what and how many times they had been interrogated, whether any records existed of these interrogations, whether they had access to a lawyer and independent medical assistance and if they had been subjected to torture or other ill-treatment. Encourage judges to summon authorities responsible for detention to provide information on conditions and circumstances of detention and to subpoena records which may potentially include exculpatory evidence. 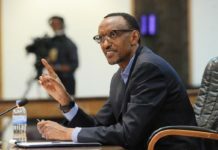 Complete the review of Law N° 18/2008 relating to the Punishment of the Crime of Genocide Ideology and bring it in line with Rwanda’s obligations under international human rights law. Revise Law N° 47/2001 of 18/12/2001 on Prevention, Suppression and Punishment of the Crime of Discrimination and Sectarianism to bring it in line with Rwanda’s obligations under international human rights law. Ensure that international and Rwandan human rights organizations have unhindered access to all Rwandan detention facilities and are able to interview detainees in private. Ratify the Optional Protocol to the Convention against Torture. Provide Victoire Ingabire with an appeal trial which complies with international fair trial standards. Ensure that Victoire Ingabire is not convicted in relation to her legitimate and peaceful exercise of freedom of expression. Test the evidence, including by asking probing questions about individuals who may have been detained in secret or military facilities to ascertain when and by whom they were arrested, where they were detained, by whom, about what and how many times they had been interrogated, whether any records existed of these interrogations, whether they had access to a lawyer and independent medical assistance and if they had been subjected to torture or other ill-treatment. Summon authorities responsible for detention to provide information on the conditions and circumstances of detention and subpoena records which may potentially include exculpatory evidence. Ensure that all lawyers are able to access, at the earliest appropriate time, appropriate information, files and documents to enable them to provide effective legal assistance to their clients. Show demonstrable efforts to uphold the principle of equality of arms by ensuring that each party has the same procedural means and opportunities available to them during the course of the trial and are in an equal position to make their case under conditions that do not place them at a substantial disadvantage vis-à-vis the opposing party. Decide on matters impartially, on the basis of facts and in accordance with the law, without any restrictions, improper influences, inducements, pressures, threats or interferences, direct or indirect, from any quarter or for any reason. 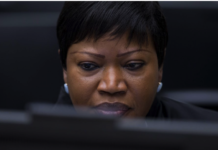 Call for Victoire Ingabire’s appeal trial to comply with international fair trial standards. 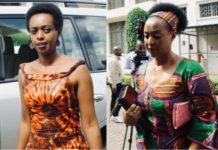 Request the Rwandan authorities ensure that Victoire Ingabire is not convicted for her legitimate and peaceful exercise of freedom of expression. To read the full document published by Amnesty International on the case, please click here. 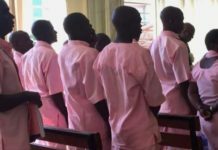 Boniface Twagirimana, interim Vice-President of FDU-Inkingi, reported on his facebook pages that his colleagues who came to listened to the hearing of their imprisoned leader have been taken into custody by the police. The aim was to restrict them from attending. Among the detained is Sibomana Sylvain, interim Secretary General of the party. Security forces were stationed at all road junctions leading to the High Court in Kigali. Anyone suspected of heading there was apprehended, beaten and put in police vehicles. Previous articleRwanda: Supreme Court to open the appeal in the case of Political prisoner Madam Ingabire tomorrow. Next articleRwanda : Police attacks Ingabire supporters heading to the supreme court to hear the case of the political prisoner.